I'm looking for more color schemes. If you would like to contribute a color scheme, all I need is the link to a Google Document with the scheme in it, like the colortable tab in this spreadsheet. 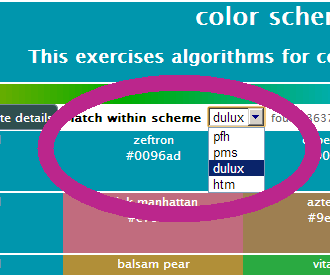 Select the color scheme in which you want to find the closest matches and create palettes. I've loaded 4 so far. It's easy to load more. If you have a scheme you'd like to load let me know. Various ramps and palettes will be created by searching the selected scheme for the closest matching colors. Here' we'll see the 5 nearest colors in the scheme, and various palettes based on hue, lightness and saturation using a couple of different models. 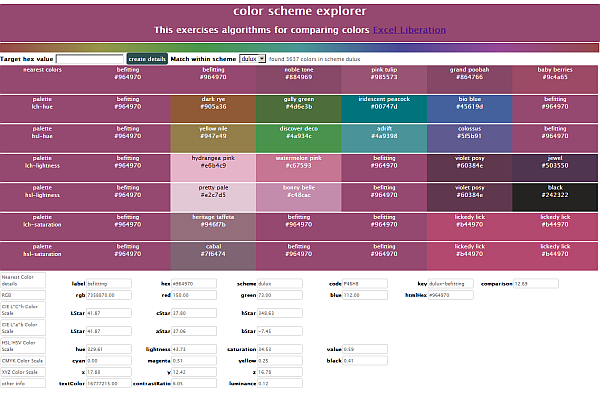 In each case, the closest match in the selected scheme to the ideal color is shown. You'll notice that if you don't select a color by the time it has loaded a default scheme, it will select a default color and process it. 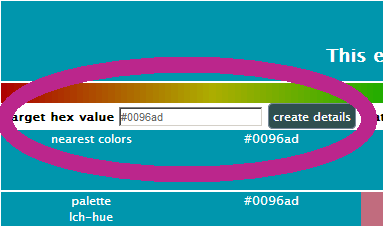 The theme of the banner is also changed to match the selected color with an appropriate color ramp.